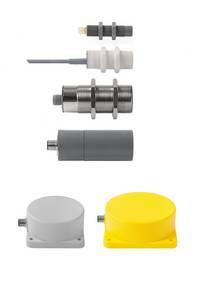 Capacitive sensor with programmable time delay eliminates the second sensor in a silo. If the sensor detects no material, the adjustable delay starts (1s to 10 min) starts, when the output is activated. Capacitive level sensor with analog output. 10 sensor segments compensate errors due to moisture fluctuations. The measuring range of 300 mm is comfortable with Teach-In adjusted.